How Does Volcanic Ash Affect Climate? Before we can answer the question, “How does volcanic ash affect the climate?" it is necessary to understand a little of how climate works. Life on earth is possible because of the combination of our proximity to the sun, which is about 150 million kilometres away, and our planet’s atmosphere. If we were much closer to the sun, the planet would be too hot to sustain life as we know it today; much further away and the temperature would be too cold. The sun is responsible for heating the earth by solar radiation (although the inside of the planet is hot as a result of gravitational compression and radioactive decay). Earth’s atmosphere (considering just the troposphere and the stratosphere) is approximately 50km thick and it permits life to exist on the planet. About half of the solar radiation the earth encounters is at the wavelength of visible light, between 400 and 700 nm. Solar radiation is absorbed by the world’s oceans, land masses and vegetation and is then partially re-radiated back towards space. Without the atmosphere, the daytime temperature would soar and the night temperature would plummet as all this radiation would be lost to space, but certain gases in the atmosphere absorb some of the re-radiated energy and trap it within the atmosphere, maintaining the planet’s temperature within a range able to sustain life. The gases responsible for this vital function are known as greenhouse gases. So, how does volcanic ash affect climate, then? Volcanic eruptions can be very energetic events which are capable of pushing material high up into the atmosphere. The larger debris and heavier particles emitted by an eruption will not attain any great altitudes and will quickly fall back to earth close to the volcanic event, but ash particles can be very small and so can forced high into the atmosphere by the explosive force and heat associated with an eruption (see the companion article for a description of what volcanic ash is composed of). For instance, when the Mount Pinatubo volcano in the Philippines erupted in June 1991, ash was sent approximately 20 km up into the sky. The eruption released 20 million tons of ash particles and sulphur dioxide into the atmosphere. The ash material was believed to have remained in the stratosphere for three weeks. The ash cloud can reflect more solar radiation back to space due to scattering from the surface of the particles, thereby reducing solar heating of the earth’s surface beneath the cloud. 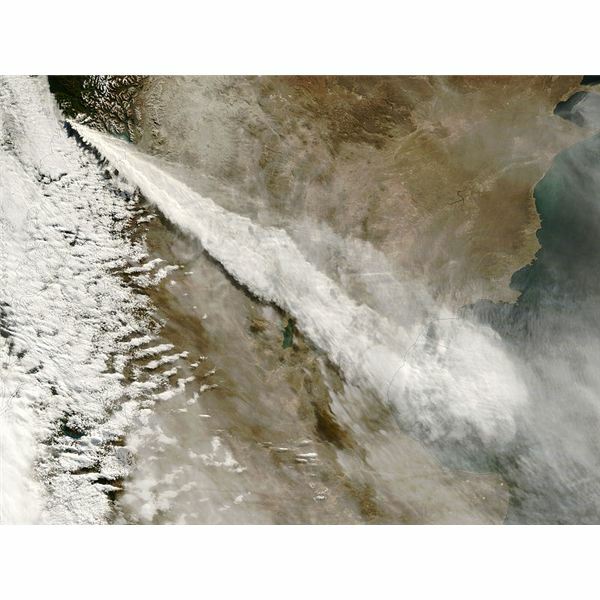 This effect is known as “radiative forcing" and is also contributed to by micron-sized aerosol particles of sulphuric acid which are formed by hydration of the sulphur dioxide released by the eruption. Some sulphuric acid aerosol particles are believed to have residence time in the stratosphere of three to four years. The volcanic ash cloud is also able to absorb re-radiated energy from the earth’s surface; just as greenhouses gases do. According to Jason Wolfe’s article , this phenomenon explains why the stratospheric temperature rose and the tropospheric temperature fell in the aftermath of the Mount Pinatubo eruption. Increased solar radiation scattering (back into space) was responsible for tropospheric cooling since less energy reached the surface of the planet; however, in contrast, the stratosphere warmed since more of the energy re-radiated from the surface of the planet remained within the stratosphere. The magnitude of any climate effects caused by volcanic activity, therefore, will depend on the degree of explosivity of the eruption (dictating how high ash will rise into the stratosphere) and the extent and duration of the eruption (which will determine the mass of ash produced).